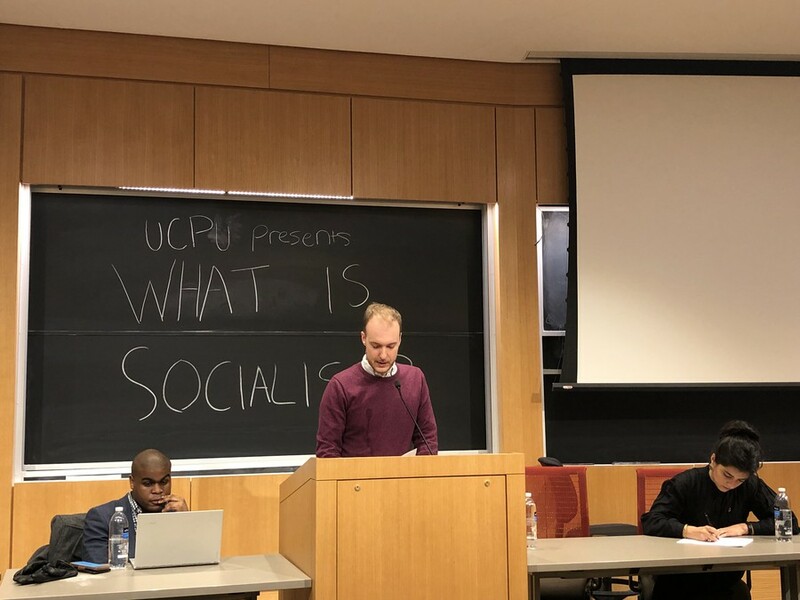 New Yorker staff writer Osita Nwanevu joined Democratic Socialists Micah Uetricht and Marianela D’Aprile to discuss the meaning and future of socialism. Left to right: New Yorker staff writer Osita Nwanevu (A.B. ‘15, M.P.P. ‘16), Jacobin editor Micah Uetricht, and Marianela D'Aprile, an organizer with the Democratic Socialists of America. Nwanevu, a former South Side Weekly editor and now staff writer at the New Yorker, was speaking at a February 22 event on the meaning and political future of socialism, hosted by the University of Chicago Political Union (UCPU) in Saieh Hall for Economics—an unlikely venue for a discussion of socialism, where professors lecture daily on neoclassical economics. Micah Uetricht, managing editor of the democratic socialist magazine Jacobin, and Marianela D’Aprile, a National Committee member of the Democratic Socialists of America (DSA), joined Nwanevu in a wide-ranging talk that explored decommodifying health care, nationalizing large sectors of the economy, and accounting for the mounting youth support for socialist policies. You can listen to the podcast version of this story, by Miles Burton, on iTunes and Spotify. “Socialism is about the expansion of democracy from the political realm to the economic realm,” Uetricht told The Maroon in a phone interview before the event. The same ideals "we believe in the democratic realm – that the many should rule, not the few – should be extended to the economy." Nwanevu noted that he does not call himself a socialist—though he often writes about the socialist left—and suggested that DSA proposals, while frequently consistent with his own policy preferences, might be better described as social democracy. “If you tell people that a vision far short of socialism is socialism, you’re foreshortening their political horizons, limiting their sense of the range of political and societal possibilities,” he said. While many socialists would be thrilled to get behind proposals such as expropriating billionaires and tearing up golf courses, Nwanevu argued, those policies aren’t what is meant by socialism. Rather, socialist politics is specifically directed at the means of production—at physical and financial capital, or the parts of the economy that aren’t labor. Socialism, correctly understood, would expropriate capital and put the means of production under worker control. Defending the DSA, D’Aprile said that the aim of proposals like Medicare for All, which, in the democratic socialist vision, would decommodify the health care sector, is not only to give people material resources but to grant workers independence and autonomy. “These policies are important, not only because they give us nice things—obviously would all like to go to the doctor and not go into debt—but because they give workers more power, like Osita said, at the bargaining table,” D’Aprile said. Nationalizing key industries, she argued, is a way of ensuring not only workers’ concrete gains, but of giving them the “mobility and freedom” of being less dependent on their employers. “More and more people associate capitalism with miseries that are around them, which makes my job as a professional socialist propagandist much simpler,” Uetricht quipped. He argued that disillusioned progressives are increasingly turning to socialism out of frustration with the Democratic party—especially following Hillary Clinton’s 2016 presidential defeat—and not necessarily out of ideological purity, or having worked out every aspect of their support for socialist policy planks. “Embracing socialism is not so much about adopting a fully coherent ideology so much as a broad belief that things are really, really wrong, and they can only be fixed with a dramatic re-thinking of the fundamental features of society,” Uetricht said. D’Aprile noted that socialists believe first in a general set of ethical principles, that it’s not possible to predict what every aspect of a socialist society would look like in advance. “If you had asked, for example, a Venetian banker, or an early British trader, what would constitute a capitalist system, they would not have told you about NAFTA, or about Wall Street,” she said. Still, much of the audience remained skeptical—one student, for example, prefaced his question by noting he was generally sympathetic with friends who self-identify as capitalists. Warren, or Bernie, or Bust? The debate focused on differentiating between progressive capitalists—those who would regulate and “fix” so-called market failures—from socialists and other leftists insistent on more radical reforms. “The thinking goes that if the government can do certain things to patch up market failures, and fix capitalism, it will discourage people from feeling the need to toss the entire system aside,” Nwanevu said. Shawn Gude, a Jacobin editor who attended the event and spoke afterward with The Maroon, recently argued that the difference between Sanders and Warren is not between two candidates on the far left flank of liberalism, but from two distinct political traditions, socialism and middle-class liberalism: thus, You Can Have Brandeis or You Can Have Debs.